Brazilian history through the work of the self-taught artist Hélio Melo, a rubber tapper from the Amazonas. So, because I learned without a teacher, you can call me a forest painter. Because only thosee who have lived there are able to discover the mysteries of nature though our Indian brothers, lords of the forest. In the work Estrada da Floresta (Forest Highway) by artist Hélio Melo (1926–2001, from the Brazilian state of Acre) a rubber tapper – in Portuguese, seringueiro  –approaches a big rubber tree, which in the wild can measure in excess of thirty meters in height and almost three meters in diameter. The picture does not therefore misrepresent or exaggerate; here it is not a case of "artistic license": reality is more powerful than the imagination. Where the Western eye, confronted with the forest only sees an impenetrable green tangle of vegetation, the rubber tapper conceives a route, his own route: a mental map of his daily round in search of sustenance. When the rubber tapper sees the forest, he sees every tree individually as if it were a member of a vast family. 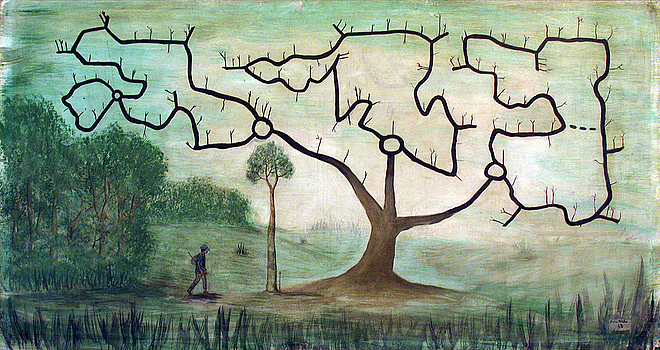 In Hélio’s picture, every limb of the tree represents a path through the forest; every branch, a tree to bleed; each round knot, a point to rest from the toils of gathering latex. Rubber became an essential raw material for the industrial development of both Europe and the United States from the second half of the 19th century onward. It formed an integral part of all vehicles and most machinery, such as valves, seals and belts. It must be remembered that, by 1927, Ford had produced 15 million Model T automobiles at the rate of nearly one million per year. Some observers have calculated that each car required more than one hundred pounds of rubber for its various components, all of which gives us an idea of the demand for wild rubber in the first quarter of the past century. During World War II, with Japan controlling the tropical areas of Southeast Asia with their extensive plantations of rubber trees, American latex once again became a strategic product,  generating renewed interest in the Brazilian Amazon as a source of rubber cultivation. It is ironic at the very least that the development of what was at the time considered cutting-edge technologies should literally have been in the hands of people who worked by hand and milked the precious "weeping tree" of its precious blood, drop by drop. Capital with its own implacable logic extended this bleeding to the entire community, which, subject to the geopolitical vagaries, experienced cycles of development and crisis all because of an unknown overseas agent which could not be controlled. The rubber tapper is carrying a rifle; he is armed. This rubber-tapper soldier is Hélio himself, who used to be a "Soldado da Borracha" (Rubber Soldier). Hélio is one of almost 60,000 young Brazilians who took part in a rubber-extraction program in the Amazon during World War II, put into place by the United States with the collaboration of the Brazilian government, in order to counteract the effects of the Japanese blockade of rubber production in Asia. The Batalha da Borracha (Battle for Rubber) was undertaken to supply the needs of the war industry and was, as such, a military undertaking; in a sense the rubber tapper therefore became a soldier; his mission being to raise rubber production exponentially from the meager 16,000 tons achieved in 1941 to 70,000 tons annually. For such an increase more than 100,000 workers were needed, leading to the implementation of an aggressive propaganda campaign. The starved inhabitants of the Brazilian Northeast, affected by what seemed an endless drought, were bombarded by tendentious images in the form of posters that showed latex spurting forth from trees in jets, effortlessly collected in buckets, highlighting the green of the Amazon rain forest as if it were some mythical El Dorado of wealth and exuberance compared with the parched Northeast. With little to lose, many enrolled in the program. However, as the economic incentives proved insufficient to raise the human contingent necessary for an enterprise of these proportions, the organizers resorted to forced recruitment. Thousands of young Northeasterners harassed by poverty decided to follow this route as an alternative to fighting the Axis Powers on the front lines, which, in hindsight, would have been preferable: of the 20,000 Brazilian soldiers who fought in Europe only 454 died, compared to the 60,000 "rubber soldiers" sent to the Amazon between 1942 and 1945, almost half of which lost their lives in the jungle without a shot being fired. The exploitation of the "rubber soldiers" was a carbon-copy replay of the inhuman working conditions of the first rubber boom, which was known as the "sistema de aviamento" [debt-peonage system], in which the worker always owed more than he produced. Since he was legally prevented from abandoning the rubber tree without having repaid his debt, the journey was usually only one way, and the contract, a contract of slavery. Popular art as an expression of traditional culture is based on a combination of elements: a craft passed on from generation to generation, a need for self-expression and a means of sustenance. In contemporary art, reference is seldom made to the aforementioned factors. Popular art and the art of "outsiders" – here referred to as contributions which generally possess a strong voice and a sense of urgency, either stand in contrast to current artistic output or complement it. In the context of the 27th Bienal de São Paulo, the work of Hélio Melo will articulate with other works dealing with notions of territory, boundaries, environmental justice, fair trade, etc., some of which were done in Acre itself: the parody of scientific knowledge in the herbarium of artificial plants by Alberto Baraya, who built a big rubber tree out of latex;  the sketch/report by Susan Turcot, which is a reflection on deforestation and its implications for symbolic and mythical readings of the forests and for local inhabitants; the analysis of survival structures and new types of community in Acre depicted by Marjetica Potrč ; the setting up of a system guaranteeing the sustainability of agricultural communities in the forest conducted by the Danish group Superflex, among others. Hélio’s painting speaks of the jungle, or more exactly, the jungle speaks through Hélio’s works, literally. Faced with the absence of pigments for his works, Hélio Melo developed his own method for obtaining them by crushing leaves (presumably those of the rubber trees themselves) and from bark, roots, fruits and by using, according to local legend, the latex as a thickener. The greenish coloration characteristic of his works is probably a result of this process. One of the pictorial techniques which recur in Hélio’s works is the appearance of a row of tapered leaves in the lower margin of the painting, which establishes a kind of theatrical foreground situating the action within "the forest". This little curtain of leaves has not been painted: it serves as an indexical trace, since it has been achieved using spear-shaped leaves, dipped in pigment and applied directly to the medium as a kind of stamp. Hélio’s painting does not only represent life in the forest but presents the forest through its extended use as both subject and paintbrush. See the interview with Hélio Melo conducted by Cristina Leite in the Guide of the 27th Bienal de São Paulo, p. 94. Seringueiro: from the word siringa or rubber tree, with the -eiro suffix of an agent. Apparently, the trees found in Acre, a variety known as Hevea brasiliensis also known as Acre fino, are the largest of their kind in the Amazon. Cf. Wade Davis, El río. Exploraciones y descubrimientos en la selva amazónica, Bogotá, Banco de la República/El Áncora Editores, 2001, p. 423. "For them [the rubber tappers], the term Hevea Brasiliensis held no meaning. The rubber trees were recognizable by the color of their bark. Richard Evans Schultes considered them to be of one variety, whereas the ethnobiologist Richard Evans considered there to be three subdivisions of the same species: the seringueira branca [white rubber tree] with grayish bark, smooth and slender, producing a milky latex, which is secreted in flooded areas during the rainy season; the seringueira preta [black rubber tree], found in the lower areas, damp and flooded for most of the year with a soft mauve bark; and finally the seringueira vermelha [red rubber tree], which is the least abundant and is to be found interspersed with the white and black varieties, its bark a smooth terra cotta and its latex creamy, almost yellow". Wade Davis, op. cit., p. 416–417. Wade Davis, op. cit., p. 355. According to Trotsky, towards 1926 England controlled 70% of world rubber harvests, while the United States consumed 70% of this production, which led to diplomatic tensions between the two countries. Cf. León Trotsky, "Europa y América", 1926. image. This was told to me on several occasions in Rio Branco by those who were acquainted with Hélio Melo, an assertion, however, that without chemical analysis would be impossible to corroborate. Between 1976 and 1988 more than forty empates saved 1.2 million hectares. Mendes was murdered in 1988 by hired killers contracted by a landowner, Alves da Silva, who had vainly tried to buy the farm where Chico had worked in order to have him expelled. Adrian Cowell at Chico Mendes, consulted on April 10, 2006. "Built between 1907 and 1912, this odd railway, isolated in the middle of the Amazon plains, stretching from the Atlantic to Bolivia, escaped the flooding of the Madeira and Mamoré nineteen times. Financed by the Brazilians by way of compensation for the annexation in 1903 of the territory belonging to the Bolivian Acre, its construction cost more than six thousand lives, approximately one per forty meters of track". Wade Davis, op. cit., p. 424. In reference to this, one of the members of the Moring Commission, appointed by the Imperial Government to assess the cost of the project, stated: "It saddens us to see so much money squandered at such great sacrifice with so little to show for it". Quoted by Francisco Foot Hardman, Trem-Fantasma. A ferrovia Madeira-Mamoré e a modernidade na selva, São Paulo, Companhia das letras, 2005, p. 126. It shouldn’t be forgotten that the English term "rubber" is derived from the observation made by Joseph Priestly in 1770 that, when rubbed on a sheet of paper, pieces of raw rubber erased the lines of a pencil. Encarta: Caucho. Egina Carli de Araújo Rodrigues Carneiro and Eduardo de Araújo Carneiro, "Acre e o mito fundador", text sent to the author by email. Referring to the evangelistic activity in the equatorial rain forests in the 1950s. Wade Davis, op. cit., p. 346. Hélio Melo, op. cit., p. 13. See the interview with Marjetica Potrč conducted by Luisa Duarte in the Guide of the 27th Bienal de São Paulo, p. 166. Curator based in Bogotá. Co-curator of I Poly/graphic Triennial, Puerto Rico (2004), 27th São Paulo Biennial (2006), among others. Artistic Director of Philagrafika, Philadelphia (2010). This text was originally published in the catalogue of the 27th São Paulo Biennial: 27a Bienal de São Paulo: Como viver junto. São Paulo: Fundação Bienal de São Paulo, 2008, pp.129-151. * 1926 Vila Antimari, Boca do Acre, State of Amazonas, Brazil. Visual artist, composer, musician, writer, seringueiro (rubber gatherer). Interview with José Roca about the space and program for contemporary art he has initiated together with Adriana Hurtado in Colombia.